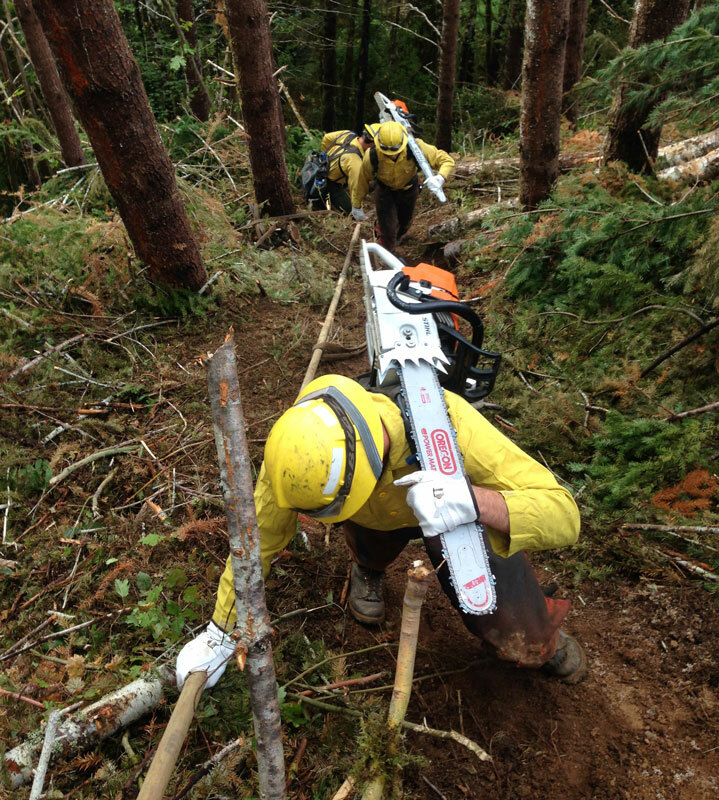 Wildland firefighting demands a high level of physical fitness to safely perform daylong work in difficult environmental conditions including steep terrain, extreme temperatures, high altitudes, and smoke. For this reason, a physical fitness test is conducted to ensure individual and crew safety. The Work Capacity Fitness Test, more commonly known as the Pack Test, is a three-mile hike over level terrain carrying a forty-five pound pack. To qualify, the test must be completed in less than 45 minutes. However, this should be looked at as a minimum fitness threshold. To be successful as a wildland firefighter you should be able to meet this requirement with ease. Upon the completion of the Pack Test, crew members will complete a 1.5 mile run (without a pack). Your time will be recorded and factored into your evaluation. Crew members will complete a one minute push-up and one minute sit-up evaluation. There is no particular threshold necessary to advance, but your performance will still be factored into your evaluation. Wildland Firefighting is a physically demanding profession. A high level of physical fitness is essential to an individuals success as a wildland firefighter. The fire season will not get you in shape, but slowly take it out of you. It is important that crew members take responsibility for their personal wellness and job performance by showing up in shape, ready for the fire season. One crew member’s lack of personal preparedness can endanger an entire crew’s safety and morale. FireFit was developed to provide the wildland fire community with a comprehensive, easy to follow fitness program that addresses pre-season, fire-season and post-season fitness needs. This program attempts to address the specific needs of wildland firefighters who deal with complex, high stress situations that require not only muscular strength but also muscular endurance, cardiovascular conditioning and flexibility for prolonged periods of time while under duress.